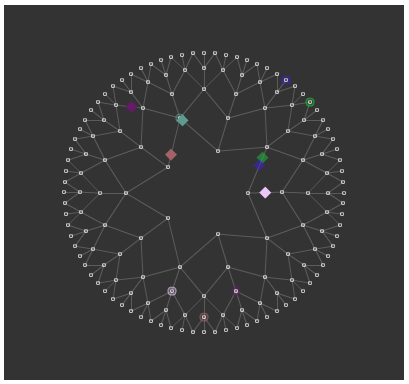 This guy appears to be doing some work on network-based artificial intelligence… in flash. I wouldn’t have thought flash would be a first choice of programming language if you’re into experimental computation. But you gotta admit, it sure does look pretty. Maybe Netlogo should hire a designer to gussy up their applets. Right after they get around to going open source. Stephen Wolfram Building A Search Engine That Models the World? Stephen Wolfram, post-boy-genius egomaniac and author of the book that received the best bad review ever, is making a search engine. Except it’s not a “search” engine exactly, because it doesn’t look for websites that have the answer to your question on them, it figures out the answer to your question. How? If the descriptions of the engine I’ve read are accurate, and they can’t be, it essentially runs a model of the world, constructed of all the theoretical constructs which Wolfram an co. have been able to represent in some kind of Mathematica-based ur-language and a massive pile of curated raw data on everything. So I suppose if you ask it “how long would it take for me to fall from 30 000 feet”, it determines semantically that you are asking a question about gravitic physics, calculates distances, speeds, resistances, and masses, and tells you a number. And if you ask it, “will it hurt?”, it fires up it’s nueron-emergent model of the brain and says, “yes”. Or something. I don’t know. Look, it’s possible Wolfram really is a genius and not just a strong technician, and consequently could be building a revolutionary search engine which commensurates knowledge from diverse conceptual domains into a meaningfully live intelligence grower. I’m certainly curious to find out. Yesterday there was 2 hour webcast demoing the engine. I’m not curious enough to watch it. But they’re promising it will go public in May. What questions do you have? I’m tickled to see that Andrew Crooks at the GIS and Agent-Based Modelling Blog wrote up a little post about my “Generations” extension of the classic Shellings segregation model. I only wish I had a NetLogo version, or something runnable that people could play with. Not that it’s a ground-breaking model, but I thought it was a fun little experiment. Unfortunately, it’s hard to share around Repast java code, or rather it’s easy to share the code but hard to get it running on a new system. I don’t think I even know how to get that model running on my own computer now, shy of installing Eclipse and teaching myself to use it to link libraries again. What I learned from the netlogo-user’s mailing list digest tonight: the Colorado School of Mines has a Division of Liberal Arts & International Studies. All Your Tomorrows Today is a Ken Hollings/BBC documentary about the early days of RAND Corporation. Assembled by Curtis LeMay’s post-war Airf Force and highly influential to US cold war political strategy, the RAND people were early systems thinkers, and their systems were comprised largely of nations and nuclear weapons. They desired rationality on topics that don’t lend themselves to rationality. And perhaps shouldn’t, but don’t suggest that to the main characters in this story. I particularly like one critic’s suggestion that RAND generated a “rumor of war”, which is his term for a set of disjointed facts which give the illusion of representing the whole truth. These people are what Dean Bavington would decry as ‘epistimological’ complexity thinkers. They are willing to see the world as complex, but only as an intermediary step to understanding it deterministically. And just think, they had the ear of the people who had their finger on the button. And yes, there is coverage of the invention of the internet. I knew the standard story about it being a communication system meant to withstand a nuclear strike, but I didn’t realize just how literally and directly that was true. Although set in the Santa Monica sun, the whole story is frankly spooky. Eric Russell’s GIS extension for NetLogo has been released as a 1.0 version. Eric has licensed it as fully open source, in the hopes that it will be developed further by the community, which is great. It will come bundled with the 4.0.3 version of NetLogo, which is due out shortly (and will not be open source at all. When CCL? When?). It’s too bad the upcoming Language as a Complex Adaptive System conference won’t have a poster session, or I’d use the GIS extension to roll some realistically spatial population-distribution data into my accent formation model and see if it generated any interesting results to poster up. Woke up to find this elegant little conceptualization in my inbox. It’s from Jim Lyons, who is one of the alpha boffins on the ridiculously helpful netlogo-users discussion group. While I was preparing my hangover, apparently Jim was preparing something for me to peer at through it. This simple model exhibits chaotic behavior with very little code. when the distance is below a certain small threshhold, it just coasts. Interface, make setup and go buttons and set View Updates to On Ticks. Eric Russell has released an early-development version of an extension for using GIS data in the NetLogo agent-based modeling environment. This is fairly large good news to a fairly small group of people. I’m one of them. In addition to bringing raster-based data into NetLogo models (such as using USGS elevation data in this Grand Canyon model that Eric previously contributed to) the extension allows for import of vector data in the form of shapefiles. The shapefile format is openly-documented, but that still can’t have been easy to build. Assuming it works, doing so should substantially lower the barrier to integrating truly interesting real-world data into agent-based models, especially for people who don’t want to dedicate the bulk of their effort to that task. I haven’t tried it yet, so I can’t speak to stability. Installation looks to be pretty easy though. It’s very possible this will come in very handy with my pending research. Back during the winter break, I read Stephen Levy’s 1984 book Hackers – Heroes of the Computer Revolution. It expounds ad nauseam on the “hacker ethic“, which among other things means free sharing of tools for making tools. Also over the break I was starting my agent-based model of Bornean fruiting synchrony. I’m making it with the NetLogo agent-based modeling environment. While programming the model I found I really wanted to be able to visualize NetLogo’s random number generators, and their parameterizations. So I made a random number distribution visualization tool. And in the spirit of the Hacker Ethic, I prettied it up and put it on the website in case anyone else wanted one. I posted to the NetLogo user’s group, but I forgot to mention it here. So if you’ve been looking for a visually-oriented way of understanding the randomization tools in NetLogo, hey, there it is!